Welcome to the Green Bhakti web log! As I reflect on the past year, I am grateful for so much, but one thing in particular really stands out to me. I am so grateful for the changes I was able to make internally and in my life last year as the result of participating in Amma’s 3-Step Plastic Challenge. In case you aren’t aware of that challenge, last year Amma launched a Source Reduction Campaign in an effort to raise awareness about the detrimental effects of single-use plastics on Mother Nature and inspire us to make small changes and better choices. All who wanted to participate were asked to calculate their plastic footprint and make a pledge to reduce their dependence on single-use plastics. Like many other people, I took the pledge very seriously. I did a lot of research, read a lot of zero waste blogs and tried a lot of new products. These are a few of the discoveries I made and products I tried and love! One of the first decisions I made was to stop using paper towels and this was probably the hardest habit for me to break at first. 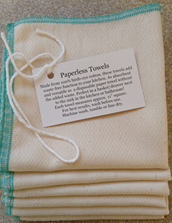 I did a lot of research and decided to order some ‘paperless paper towels’ from a zero-waste shop on etsy.com. I love to support independent artists who are trying to make a difference in the world. It’s also easy when working with a small business owners to request they not use plastic when they package the items. These beautiful little towels are made of 100% cotton, are absorbent and great for cleaning counters, glass or windows. They hardly take up any space, so I just throw them in with my regular laundry loads. Looking back now, I don’t even miss the paper towels and I can’t imagine ever going back. 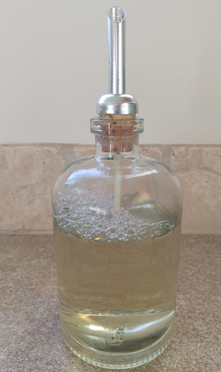 This glass soap dispenser from etsy.com is also a favorite. I use it for my dish washing soap. When I’m down to the dregs, I take it to my local grocery store, weigh it first, then refill it from the bulk section. It looks fresh and pretty on my counter and I’ve had several compliments on it! One of the best discoveries during my search to find plastic alternatives was coming across The Package Free Shop. They do not use plastic in their packaging and their products are sustainable and zero-waste. On their site, I found my latest obsession – my 100% compostable beechwood toilet brush! It’s made in Germany by an ethical family business committed to creating high quality products from renewable materials. I know it sounds strange to be obsessed with a toilet brush but this thing is really cool. It should last forever but if it does reach the end of its life, the little terracotta dish can be removed, sanitized and used for something else and the entire brush and holder can be composted! 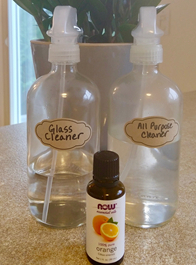 I also took a look under my cabinets and in my hall closets and decided I no longer want to buy cleaning supplies containing toxic chemicals in plastic bottles. I read a lot of blogs and websites that had suggestions and recipes for DIY alternatives. I bought these beautiful glass bottles and although they have plastic sprayers, they are made very well and should last a long time. They’re compatible with my attitude of not being completely against plastic if it can be long-lasting or reusable. I feel much better cleaning my counters, sinks and toilets with these natural ingredients that won’t harm the environment. I can also get all of the ingredients in bulk, except the essential oils – and those come in glass bottles, not plastic. I found a couple recipes for earth-friendly household cleaners that seemed to be consistently used by various people, with good reviews.. The 3-Step Plastic Challenge really opened my eyes and inspired me to find alternatives to single-use plastics, to break out of old habits and conditioning, and to research and learn about new products. Basically, I am now living more in alignment with Amma’s teachings about protecting and caring for Mother Nature and it feels really rewarding. I am looking forward to discovering more ways to Refuse, Reuse, Repurpose and Reduce my dependence on single-use plastics. You can also find Diya's articles in various editions of the Pacific North West Green Friends newsletter. The views and opinions expressed in this blog are solely those of the author. These views and opinions do not necessarily represent those of greenfriendsna.org, and/or any/all contributors to this site.